The Del Sol Energy showroom is located in the heart of Brentwood’s Historic Downtown Corridor. With door’s open to the public daily, we welcome everyone who is interested in exploring solar or comes in asking questions about solar energy. We recognize our educational showroom is a great place to start understanding how solar works and how we can channel the power of the sun in our daily lives. But, we are also acutely aware that even in our expansive showroom, we have our limitations. And that is why we decided to reach out. Brentwood, and the East Contra Costa County Delta region, has historically been classified as a Farm and Agricultural community. Looking into our history, farms, ranches and orchards are what covered the land. This type of agricultural community is what our current community is built on. Even today, local farm stands with freshly picked strawberries, cherries and corn adorn street corners and bring masses of people to town annually. Farming is in our roots. Yet, as years passed, much of the agricultural land was sold to developers to make room for new families moving into town. Yet many families are working hard to preserve the land, the farms, and the agricultural community. And they are doing it through education. First Generation Farmers is a local farm that focuses on recruiting, training, inspiring and mentoring the next generation of farmers. Their story is powerful, and they are making a big impact in the community at large. For more information on their programming, check out their website at firstgenerationfarmers.org. We were honored when they were willing to work with us to teach kids about solar in a way that was a bit more tangible than the big, bulky solar panels we install on roof tops. This last Tuesday, we packed up our cars and many of our kids and we headed out to First Generation Farmers to learn about cooking with solar power. Although many of us have worked within the solar industry for years, not one of us knew anything about cooking with solar power or where to even start. Luckily, the educators at the farm knew exactly what to do and put our kids to work. The kids aged from 2 years old through about 10 years old. The process was definitely a bit easier for the 10-year-old than it was for the little kids, but every single kid was entranced with using a weird box that was powered by the sun to cook with. Even as adults, we were a bit skeptical. 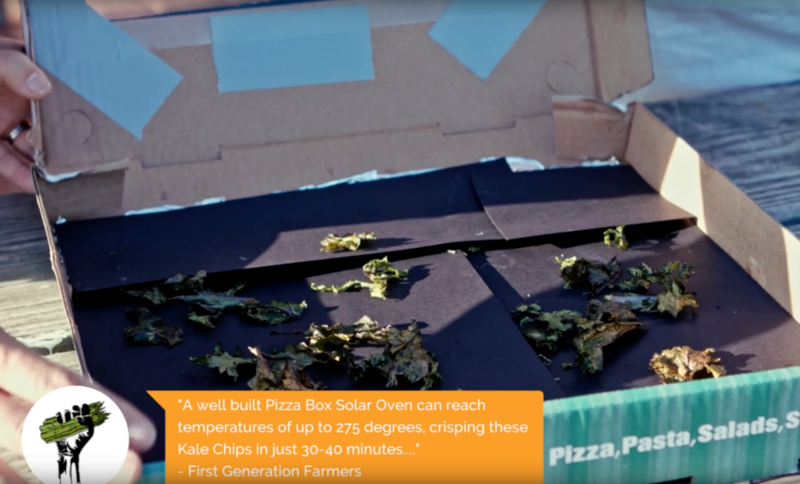 It took about an hour, but the Del Sol Energy kid’s were able to effectively build two solar ovens using an old pizza box, duct tape, tin foil and some glue. Not only were they able to complete this process with just a bit of assistance from their educator, all their ovens worked! 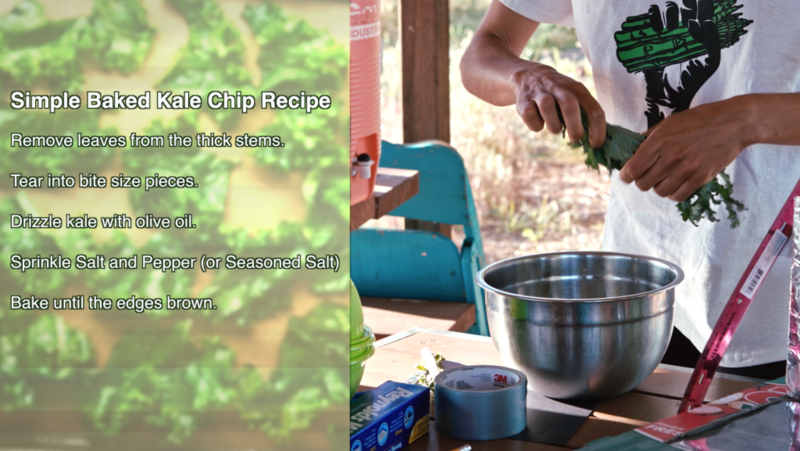 Perhaps even more exciting was all of the kids enjoyed the kale chips their solar ovens cooked out in the powerful afternoon sun. At the bottom of the post, you can see full instructions on what we did to build our ovens. The science of solar energy is often seen as a bit elusive, we see panels and we know they work, but we aren’t quite sure how. And frequently, when we think solar, we jump to the commercial side of panels and solar companies. But, solar is much more than the Sunruns, Solar City, and Solar World. Solar power is truly sun power making a difference in how we manage daily tasks. Cooking, and eating, are something we are all familiar with. And when we can use household materials to do something that are used to doing every day, the science becomes a bit more tangible and relevant. Plus, teaching kids about solar and renewable energy is vitally important. And we all know we think through our stomachs – so, introducing renewable energy though food is a fun and easy way to promote using our natural resources to complete the tasks we do daily. Even more importantly, it is fun! 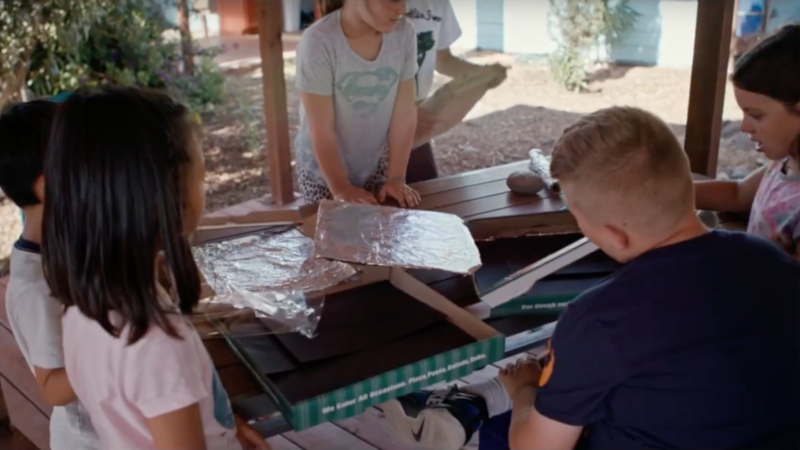 Making a solar oven is something everyone can do at home with their kids. And maybe you don’t make kale chips – maybe it is toast, a pizza or maybe even an egg! The food options are numerous, but the lesson remains the same. Our visit to First Generation Farmers was truly fun. It was family, kids, friends, food and lots of laughter sprinkled with a lot of learning. It was time we spent together learning more about our industry through the eyes of our kids and our community partnerships. Although it was our first visit to the farm, we can promise, it most definitely won’t be the last. And as the sun kicks into high gear as we head into the summer season, we are all ready to build our home solar overs and cook with sun power this summer. Step 1: Draw a square on top of the pizza box that’s about 1-2″ smaller than the box itself. Use the box cutters to cut along the line, on the right, left and bottom of the box, creating a flap that open upward. Step 2: Cover the underside of the flap and the inside of the box with foil, shiny side out. Try and keep it as smooth as possible! Glue it down so it doesn’t fall off. Step 3: Inlay the box with the black construction paper, gluing it to the bottom so it stays put. Step 4: Tape the clear sheet protectors to the lid of the box to seal the opening created by the flap. The seal should be as airtight as possible! Don’t forget to add the tasty treats into the oven before it is taped up! Step 5: Place your oven outdoors in direct sunlight on a hot day. Step 6: Close the lid of the box and prop the flap open with a stick. Leave your snacks to “cook” for about 30 to 90 minutes. Depending on how airtight your oven is, you could see temperatures around 200 degrees! As for us, I think ours was rather drafty and the sun going down wasn’t helping. Even so, we saw about 120 degrees. Step 7: Enjoy your treats! Interested in learning more about solar? Stop by our showroom at 225 Oak Street in Brentwood or call us at (925)378-4800. We are happy to provide you with a FREE quote, just click here.